2 What does Impetigo look like? 3 What Causes of Impetigo? 4 What are Signs & Symptoms? 5 How to Treat Impetigo? 7 Is Impetigo Contagious or Not? Impetigo affects both men and women but it is very common to infants and children, however the infection is also frequent to those individuals who live in a confined environment. It is a type of skin infection caused by bacteria; the Staphylococcus aureus and the streptococcus pyogenes. These bacteria can cause red sores which may develop in any part of the body; but commonly appears on the neck, hands, and face and for children who wears a diaper, impetigo can also develop in the diaper area. This disease does not last for months or years for it clears on its own in a span of two to three weeks’ time and can even heal faster by preventing it or using some medical treatments. Impetigo is seen as sores that are red or blisters that is somehow itchy and appears mostly on the child’s face, mainly on the mouth and nose. As the red sores open, a certain substance in a form of a fluid leaks out, and unfolds into yellow-brown coloured crusts. Bullous Impetigo – This affects most children below the age of two. There will be red blisters showing on the body parts that are also itchy. These blisters last longer than all the other blisters created by the other types of impetigo. 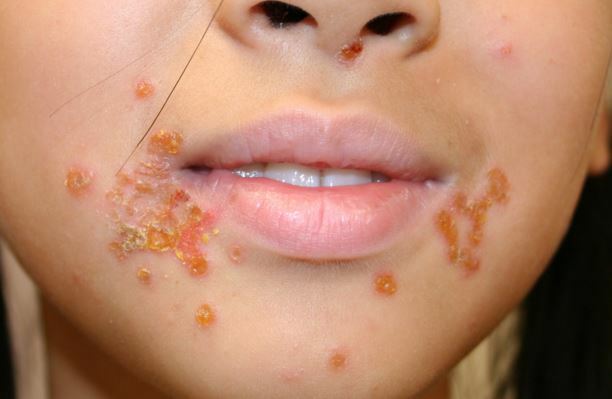 Impetigo Contagiosa – This is still common to children in general. This condition is also termed as nonbullous impetigo wherein sores that are red in color begin around the mouth and nose. Ecthyma – This is considered to be the most severe of all due to how it influences not only the top layer of the skin but also the second layer. Blemishes and inflamed lymph nodes may also appear. Blisters tend to throb so badly and may lead to ulcers or open sores. 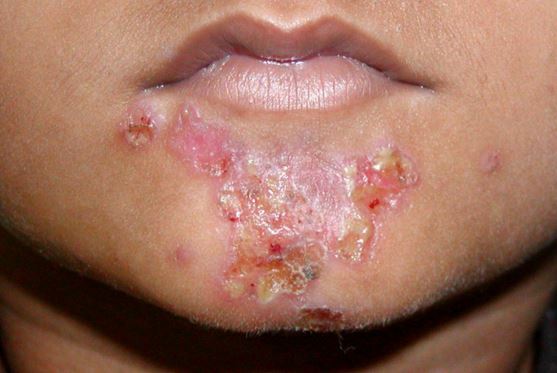 Impetigo is caused by either one of the bacteria; the staphylococcus or streptococcus. Whether the skin is completely healthy or not, it is still possible to get infected. 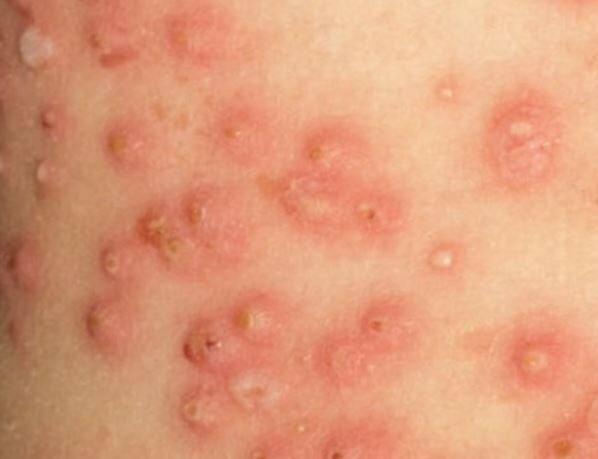 The person becomes infected with impetigo when from the very start, other skin problems are already present like eczema or any other injuries and irritations and the bacteria gets into the body at the same time. Children might also acquire impetigo after some certain allergies or colds that have caused the skin below the nose raw. 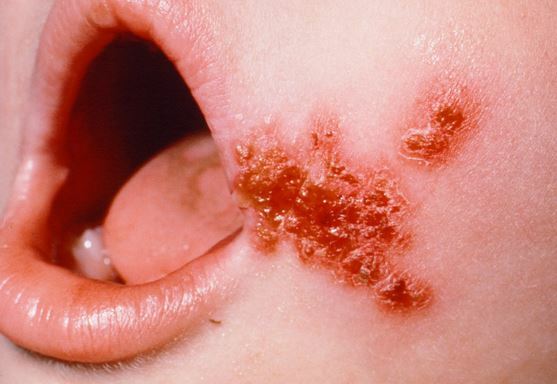 Staphylococcus causes impetigo to disperse to nearby skin and contain toxins that pounces on the proteins of the body that keep the cells of the skin bounded. Once these proteins are harmed, the bacteria will then rapidly spread. There are two ways that may trigger the beginning of an infection which are; Primary Impetigo wherein the bacteria intrudes on the skin through a lesion, and Secondary Impetigo wherein the infection is caused by other skin conditions that damaged the skin. What are Signs & Symptoms? The signs and symptoms of impetigo can be very uncomfortable for children and embarrassing for adults especially when the red sores are found on the face. The sores that last for a few days before it forms into the honey coloured crusts can also scatter to other areas of the body by fingers, towels, and clothing that touched the skin. There are different types of impetigo and they differ in symptoms though there are still similarities. Impetigo is seldom serious since most sores heal on its own with just a couple of weeks. Treatments will depend on which type of bacteria is causing the impetigo and in order to determine this, the physician will take a swab over the area that is affected and have it sent to the laboratory. It is important to know which bacteria are present to get the right prescription. If it is only mild and farm from serious, the physician will advise the patient some methods concerning the person’s hygiene in order to treat the skin and preventing the sores to spread all over. Home remedies – Clean the affected area by washing it with water or an antibacterial wash. Avoid scrubbing since it can cause irritation. Dry the skin afterwards and apply an over-the-counter antibiotic ointment to be applied directly to the sores. A non-stick dressing – This stops the sores from scattering and protected from touching. Oral antibiotics – The prescription of the physician can either be oral or topical antibiotics, in a form of liquid for children and pills for adults. The antibiotics should not be discontinued just because the symptoms had lessened. It should be completed as directed in order to fend off the infections from coming back since the infection will once again return and the body might be immune to the antibiotics. Antibiotic creams – These are given by the physician for a more severe case of impetigo. Cleaning the skin for proper absorbing of the sores is a must before applying the cream. Is Impetigo Contagious or Not? Impetigo is a contagious condition that can be distributed to other individuals through skin-to-skin contact or by sharing or touching things owned by the person with impetigo. Scratching of the infected skin will also cause the sores to spread to other body parts. A child who has impetigo should not be brought to a day care or be at school until the condition is no longer contagious which happens normally after 24 to 48 hours after the treatment of antibiotics begun. Without the antibiotics prescribed, impetigo will remain contagious unless it is completely healed. Vos, T (Dec 15, 2012). “Years lived with disability (YLDs) for 1160 sequelae of 289 diseases and injuries 1990-2010: a systematic analysis for the Global Burden of Disease Study 2010.”. Lancet 380 (9859): 2163–96. Cole C, Gazewood J (2007). “Diagnosis and treatment of impetigo”. Am Fam Physician 75 (6): 859–64. Kumar, Vinay; Abbas, Abul K.; Fausto, Nelson; & Mitchell, Richard N. (2007). Robbins Basic Pathology (8th ed.). Saunders Elsevier. pp. 843.